You can train to be a certified Trauma Tapper with our program. Fill in the forms ONLINE (below). Once approved you will get a certificate and you can get listed with our international tappers (here). If you don’t have access to internet you can fill in on paper. Make sure you fill in online at a later point to be approved – we need all answers in our database to verify that you have passed. You will not pass the assessment unless you have read and agreed to our code of ethics. This is done automatically when you fill in the assessment. The welfare of your beneficiary is your primary concern at all times. Know that the technique is part of the solution, learn the other parts as well! 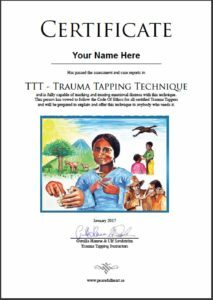 As a certified Trauma Tapper you vow to treat people with needs also if they have no resources, within the realm of your situation. You will always offer the service of Tapping as a complementary treatment, a first aid tool. Any other treatment the beneficiary is getting such as therapy or medication has nothing to do with this. You acknowledge that some skills are aquired through certification and some only through dedication, devotion and practise. vow to take responsibility for your skills and certifications and make sure you are clear about this when asked. help and share your experiences and tools with other members. maintain an awareness of research and developments in the field of Trauma and other linked fields with an open mind. Remember when dealing with victims of war and abuse that every victim has a mindset you may want to understand and respect. A soldier is taught to be strong, an abused woman or child may back away from physical contact. Adapt your approach to EVERY beneficiary and their unique situation. When you deal with beneficiaries under the age of 18 yrs or with special needs, it may be appropriate to do so with the informed consent of a parent or legal guardian if possible. everyone to learn and use. If you or anyone you meet has questions about TTT please contact us – we are here to serve, because your interest is ours.